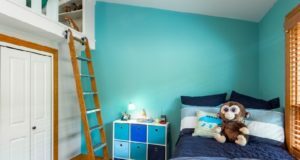 Home » Bedroom Design Ideas, Photos » What is the perfect size for a bedroom? Eventually if we closely look at the term “perfect size”, we’ll find nobody can give you the exact figure about it. The fact is it varies to house to house, person to person and requirement to requirement. So we can’t give an exact figure. Few years back, the standard bedroom size was 10*10 with queen size and inbuilt wardrobe. Still some people are comfortable with this but nowadays, 12*12 bed size is becoming the standard size of a bedroom design. 1. Type of bed: One should know how many persons will be using the room. Single person, couple or couple with children. Hence according that bed size can be finalized. The popular types of beds are single bed, Double bed, King size bed, Crib and Bunk bed. 2. Attached Toilet bathroom: Modern days, we all need attached lath-bath in the bedroom. So according to the needs, the size of bed can be measured. Bathroom area size will also considered when defining bedroom space. 3. Table beside bed: Night lamps are key attribute in the bedroom interior decoration. Hence there should be a table beside the bed which can be used as the storage unit as well as to place lamps on it. 4. Essential furniture: Dressing table and wardrobe are the key ornaments in a bedroom decor as you need dressing table every day to see how you look. And wardrobe to be used as the storage unit. Reading table and chair is also a must for modern day bedroom design. Sofas are also taking crucial place in bedroom decorating these days. So we need to consider this space as well before making decision of room size. With all above parameters consideration, we can reach to a bedroom size that you’ll love. 10*12: This is the minimum size nowadays for bedroom. 10*15: This is the average bedroom size. A*B: For maximum you can go with any size depending on the living area. What are your thoughts on perfect bedroom size? Share your views in the comment area.